How Is a Florida Estate Distributed If There Is No Will? There is no good reason not to have a will or trust. A good estate plan ensures your property is distributed according to your wishes after you pass away. But if for some reason you do not leave a will (or place your property into a trust), Florida law determines what happens to your estate. Here is a brief explanation of how the law works. The legal phrase for administering an estate in the absence of a will is “intestate succession.” Technically, intestate succession applies to any part of your estate “not effectively disposed of by will.” This means that if for some reason you omitted to include certain property in your will, it would pass under intestate succession the same as if you never had a will in the first place. The first rule of intestate succession is that if you are survived by a spouse or any children, they have the right to inherit your estate. How the distribution works depends on a couple of things. To illustrate, let’s use a simple hypothetical example: John Smith is married to Mary Smith and has two children with her, David Smith and Anne Smith. If John dies without a will, Florida intestate succession law will distribute his entire estate to Mary as the surviving spouse. But now let’s say that David and Anne were John’s children from a prior marriage. In that case, the intestate succession would go as follows: Mary, as the surviving spouse, would receive one-half of the estate, while the children would split the other half. Similarly, if David and Anne were John and Mary’s children, but Mary had a child from a prior marriage, then the same 50/50 split would occur. 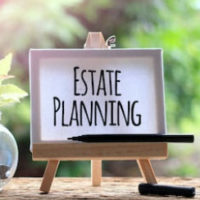 The reason for this is simple: Florida intestate succession law wants to ensure that the entire estate does not pass through a spouse to a child unrelated to the deceased individual. Now, the above examples deal with individuals who are married and have children. But what about the intestate succession of single people who have no lineal descendants (children, grandchildren, etc.)? In that scenario, Florida law looks for the next-closest set of living relatives, starting with the deceased individual’s parents, followed by their siblings and the descendants of their siblings (i.e., nieces and nephews). If no such people are living, the estate is then divided 50/50 among the descendants of the deceased person’s mother and father, starting with any living grandparents and working down through any cousins. For instance, say Bob Jones was a single man with no kids and no living parents. At the time Jones died, he had one living brother, Stanley, and two nieces born to his late sister. Under intestate succession, one-half of Bob’s estate would go to Stanley, and the other half would be divided between the nieces. Intestate succession does not take into account your personal relationships with your heirs. In other words, the law doesn’t care if Bob Jones and his brother hadn’t spoken for 30 years before Bob’s death. If Bob failed to make a will, his brother still gets half of his property. If you want to avoid this kind of situation, you need to make a will before it’s too late. Contact the experienced Fort Myers estate planning lawyers at the Kuhn Law Firm, P.A., at 239-333-4529, to schedule a free consultation today.